Only time will tell what type of villain Kylo Ren truly turns out to be. While he pulled off one of the most heinous acts fans could imagine in Star Wars: The Force Awakens, he was struggling to fight the Light Side of the Force. And there is always the possibility that he'll become good. That transformation will be explored in Star Wars: Episode VIII and Star Wars: Episode IX. Today, we get to see a different kind of transformation for this leader of The Knights of Ren. Industrial Light & Magic have shared an epic portfolio of concept art, which offers an advanced look at how some of the now-iconic moments came together for this sequel. And one of the key elements is the look of Kylo Ren's helmet. As you can see in the art below, Kylo Ren original stole more of his look from Darth Vader. While he still has a very Darth Vader-ish vibe in the finished movie, he has distinctly become his own character. At this point, we don't know too much about the Knights of Ren, or what the symbolism in the Ren helmet represents. But this is a good starting point. In fact, Kylo Ren almost had a much different look in the movie all together. According to costume designer Michael Kaplan, Ben Solo's Knights of Ren costume originally looked a lot like Captain Phasma. Phasma was actually a discarded design for Kylo that writer-director J.J. Abrams loved so much, he decided to create the Captain Phasma character based on that design. Says Michael Kaplan. "When I was trying to 'tackle' Kylo Ren's character, I thought, what if he were The Lord of the Stormtroopers, in bright shining silver armor? I had this strong image in my head which I conveyed to one of my brilliant concept artists (Dermot Power). He produced a stunning illustration which was immediately shot down by J.J.; not right for Kylo Ren! The drawing remained on our design room wall. One afternoon, Kathleen Kennedy came in for a meeting, pointed at the illustration and exclaimed: 'What is that? It's fantastic!' JJ wrote the part of Captain Phasma for the armored character, and brilliantly cast Gwendoline Christie in the role." It isn't known when exactly this happened, or how far along in the script J.J. Abrams was when he decided to create the Captain Phasma character. There were rumors early on that Gwendoline Christie's character was originally envisioned as a male role before she was cast. The costume designer also spoke about the difficulties of coming up with an original mask for Kylo Ren that wasn't derivative of anything we've seen before. "I had a take on Kylo Ren's dark layered costume and hood, very early on; it was the helmet and 'face' that was so challenging. My design team and I worked very closely with J.J. Abrams on this. You have no idea how many designs and concepts we came up with that were shot down. It's incredibly tough to come up with a mask that doesn't feel derivative of an existing super hero or to another iconic reference." 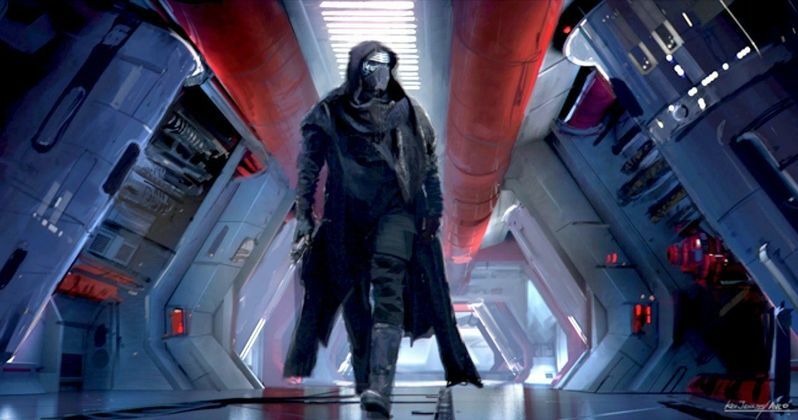 You can take a look at the early Kylo Ren concept art here. It's possible that Kylo Ren will return with an all-new mask since his presumably blew up with the rest of the Star Killer base. It's possible that this Knight of Ren could move closer to a Darth Vader look in the sequels. Or perhaps he will jettison his mask altogether as he moves closer to the Light Side. Take a look at this art and let us know what you think.